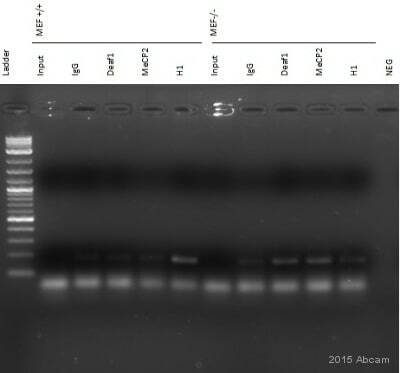 Using western blot analysis ab31972 recognises histone H1x in HeLa nuclear extract. Synthetic peptide corresponding to Human Histone H1x aa 200 to the C-terminus conjugated to Keyhole Limpet Haemocyanin (KLH). HeLa nuclear extract This antibody gave a positive result in IHC in the following FFPE tissue: Human breast adenocarcinoma. Our Abpromise guarantee covers the use of ab31972 in the following tested applications. Histones H1 are necessary for the condensation of nucleosome chains into higher-order structures. ab31972 recognises histone H1.X in HeLa nuclear extract at 35 kDa (lane 1), which is blocked using the immunizing peptide ab18052. IHC image of Histone H1x staining in Human breast adenocarcinoma formalin fixed paraffin embedded tissue section*, performed on a Leica Bond™ system using the standard protocol F. The section was pre-treated using heat mediated antigen retrieval with sodium citrate buffer (pH6, epitope retrieval solution 1) for 20 mins. The section was then incubated with ab31972, 1µg/ml, for 15 mins at room temperature and detected using an HRP conjugated compact polymer system. DAB was used as the chromogen. The section was then counterstained with haematoxylin and mounted with DPX. Chromatin was prepared from HeLa cells according to the Abcam X-ChIP protocol. Cells were fixed with formaldehyde for 10 minutes. The ChIP was performed with 25µg of chromatin, 2µg of ab31972 (blue), and 20µl of Protein A/G sepharose beads. No antibody was added to the beads control (yellow). The immunoprecipitated DNA was quantified by real time PCR (Taqman approach for active and inactive loci, Sybr green approach for heterochromatic loci). Primers and probes are located in the first kb of the transcribed region. ICC/IF image of ab31972 stained human HeLa cells. 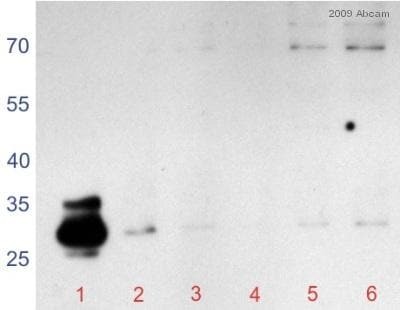 The cells were PFA fixed (10 min), permabilised in TBS-T (20 min) and incubated with the antibody (ab31972, 1µg/ml) for 1h at room temperature. 1%BSA / 10% normal goat serum / 0.3M glycine was used to quench autofluorescence and block non-specific protein-protein interactions. The secondary antibody (green) was Alexa Fluor® 488 goat anti-rabbit IgG (H+L) used at a 1/1000 dilution for 1h. Alexa Fluor® 594 WGA was used to label plasma membranes (red). DAPI was used to stain the cell nuclei (blue). Publishing research using ab31972? Please let us know so that we can cite the reference in this datasheet. Used our homemade Deaf1 antibody and millipore&apos;s MeCP2 antibody for pull down. Thank you for your enquiry. I am sorry but to date we do not have information as to the reactivity of either ab31972 or ab17729 with other isoforms of histone H1. These antibodies are relatively new additions to our chromatin range. I appreciate that this information is necessary to fully determine the reactivity of this antibody against the histone H1 isoforms. I have passed on your comments to my colleague in business development. Thank you for your feedback.